Major infrastructure projects developed by Azerbaijan open up great opportunities to enjoy transport and transit potential in the region. 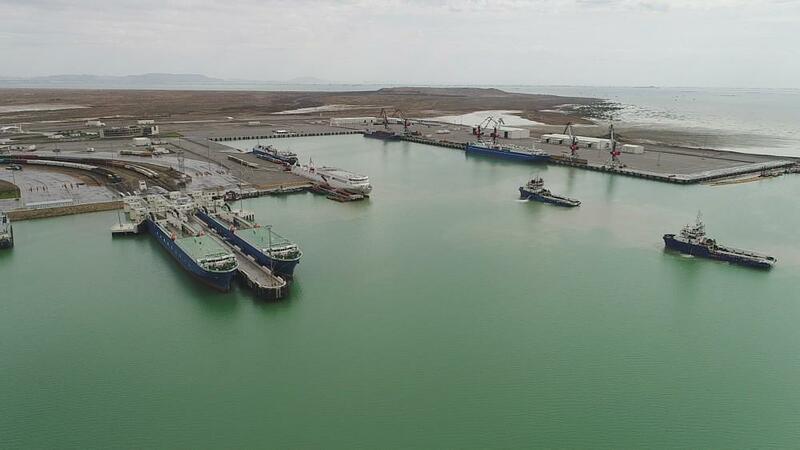 In the first quarter of 2019, the volume of cargo transportation via the Baku International Sea Trade Port exceeded 1.03 million tons, Trend reported with reference to the Port. There is a growth trend in the volume of transportation of all types of goods, according to the report. During this period, 13,788 railcars were transshipped via the new ferry terminal, located in the Alat settlement (a 12.6 percent increase compared to the same period last year). At the same time, 6,446 railcars (46.8 percent) were transshipped in the Baku-Kuryk-Baku direction, while 7,342 railcars (53.2 percent) were sent in the Baku-Turkmenbashi-Baku direction. Meanwhile 6,543 high-capacity vehicles ​​were transshipped in January-March this year (a 43.5 percent increase compared to the same period last year). As many as 5,180 high-capacity vehicles (79.2 percent) were transshipped in the direction of Baku-Kuryk-Baku and 1,363 high-capacity vehicles (20.8 percent) were sent in the Baku-Turkmenbashi-Baku direction. Passenger transportation in both directions amounted to 8,813 people, which is a 17.5 percent increase compared to the same period last year. The Baku International Sea Trade Port in Azerbaijan’s Alat settlement is expected to become one of the leading trade and logistics hubs of Eurasia. According to official information, the capacity of the port is 15 million tons of cargo, including 100,000 containers per year. The implementation of all 3 phases of construction is projected to increase the capacity up to 7,660 tons on a daily basis. Once the first phase ends, the Baku International Sea Trade Port will be able to receive up to 10-11 million tons of cargo and process 50,000 containers per year. The second stage will provide for the handling of 17 million tons of freight and 150,000 of containers, while the implementation of the final stage is projected to increase the capacity up to 25 million tons of freight and 1 million containers. In the future, it is planned to create a free economic zone in the surrounding areas, including the territory of the port. The new port in Alat is a transportation hub linking the west (Turkey & EU), south (Iran & India) and north (Russia). Situated in the vicinity of the regions of Azerbaijan, it will also increase its connectivity as an efficient hub and so increase the volume of cargo being handled. In addition, new port location is linked to existing highways and railways, connecting the port to the inland regions of the country. In 2018, the total volume of cargo transportation at all terminals of Baku Port was about 3.8 million tons. However, 84.5 percent (3.2 million tons) of total cargo accounted for transit cargo. Last year there was an increase in the number of separate services rendered in Baku Port. Thus, 22,189 TEU containers were loaded, which was an increase of 44.7 percent compared to 2017 (15,337 TEU containers in 2017). In addition, the number of passengers using services in both directions (Turkmenistan, Kazakhstan) increased by 44 percent compared to 2017 and amounted to 47,736 people.